By this machine technology cut roving and initiated resin are simultaneously applied by special pneumatic gun onto the mould. The gun is mostly hand-guided, but it is possible to use PC controlled automation. The moulds are simple, low-cost, practically the same as for hand lay-up, mostly made of composites. solidated by fin, paddle or bristle rollers of various size and shape removing the entrapped air bubbles at the same time. 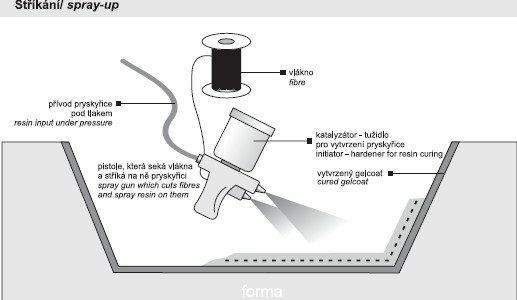 Spray-up (SU) ranks also among so called “open” technologies, therefore it is necessary to carry out it in separate air exhausted spraying boxes as the mostly used resins by spray-up are polyesters containing harmful styrene. This entry was posted in Technologies. Bookmark the permalink.